Jesus Christ often used parables to describe the Kingdom of God. What are the Kingdom parables, and why did Jesus employ them in His teaching? 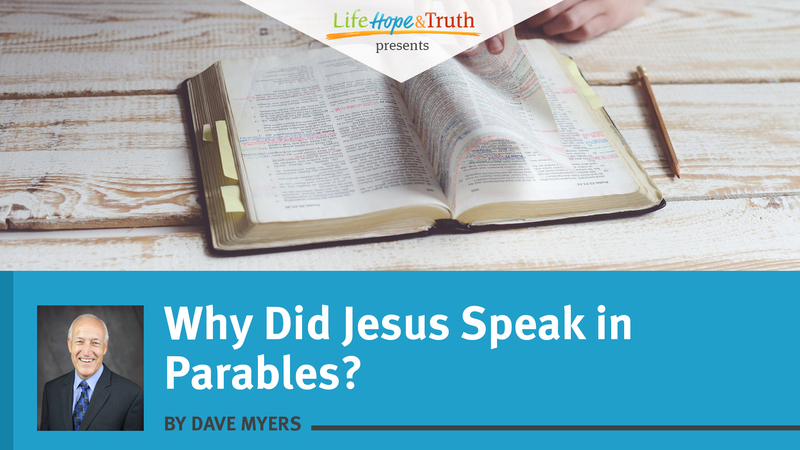 Jesus was actually hiding the meaning of His words by using parables! But why would Jesus want to? Watch Dave Myers, Foundation Institute instructor, explain in this short video. A simple definition of a parable is a comparison between one thing and another. The International Standard Bible Encyclopedia gives a more detailed definition. A parable “ordinarily signifies an imaginary story, yet one that in its details could have actually transpired, the purpose of the story being to illustrate and inculcate some higher spiritual truth” (“Parable”). It is interesting to note that parables had previously been used in the Old Testament (2 Samuel 12:1-4; Isaiah 5:1-6; 28:24-28). They were also employed in first-century Jewish literature. But “the one and only teacher of parables in the New Testament is Christ Himself. The Epistles, although they often employ rhetorical allegories and similes, make absolutely no use of the parable, so common in Christ’s pedagogical methods. The distribution of these in the Canonical Gospels is unequal, and they are strictly confined to the three Synoptic Gospels [Matthew, Mark, Luke]” (ibid.). As for the number of parables used by Christ, there are approximately 38. Different sources have different totals because not every parable is identified as such and because it is a somewhat subjective process to determine whether some parables are indeed different or if they are simply variations of a previously recorded parable. As for the distribution of the parables within the synoptic Gospels, Matthew and Luke have the most; and Mark, the least. Each of these writers, however, has at least one parable unique to his book. Many people believe that Jesus spoke in parables to simplify His message—to make it easily understood by all. Yet Christ said just the opposite. Having been asked by His disciples why He used these comparisons of ordinary events to spiritual truths, He said, “Because it has been given to you to know the mysteries of the kingdom of heaven, but to them it has not been given” (Matthew 13:11, emphasis added throughout). Jesus added, “Therefore I speak to them in parables, because seeing they do not see, and hearing they do not hear, nor do they understand” (verse 13). Jesus went on to explain that His method of teaching was a fulfillment of a prophecy given by Isaiah, stating that even though people would hear the truth of God, they would not comprehend its meaning (verses 14-15, compare Isaiah 6:9-10). In other words, Jesus spoke in parables so people would not understand. Not believing that Jesus would waste His time preaching and teaching in such a way as to block the comprehension of words that could lead to eternal life—the very purpose of His coming to earth (John 3:16; 6:40; 10:10)—some have assumed that Jesus used parables to arouse people’s curiosity. They believe that since God loves the world and wants all to be saved (1 Timothy 2:4), Jesus was simply using a technique that would lead people into deeper study and subsequent understanding of His teachings. But such reasoning is mistaken. This reasoning is a fulfillment of Jesus’ own words that most people would not understand (Matthew 13:13). In contrast to the majority of people who would not understand the meaning of the parables, Jesus told His disciples, “But blessed are your eyes for they see, and your ears for they hear” (verse 16). For those being called by God the Father (John 6:44, 65), the parables reveal profound spiritual truths. In that way, the parables of Jesus both conceal and reveal. A brief sampling of how Jesus began many of His parables and how He spoke of them to His disciples reveals their primary theme. In the book of Matthew, the phrase “the kingdom of heaven is like” is a common introduction (Matthew 13:24, 31, 33). In the book of Mark, the author explains that Jesus “taught them many things by parables” (Mark 4:2). When He was alone with His disciples, Jesus said, “To you it has been given to know the mystery of the kingdom of God; but to those who are outside, all things come in parables” (verse 11). Later, He said, “To what shall we liken the kingdom of God? Or with what parable shall we picture it?” (verse 30). From these passages we see that the primary theme of Christ’s parables is the Kingdom of God. In these parables we learn what we must do to enter the Kingdom and what it will be like. This theme is consistent with the message He taught: “Jesus came to Galilee, preaching the gospel of the kingdom of God” (Mark 1:14) and His command to His followers: “But seek first the kingdom of God and His righteousness” (Matthew 6:33). In addition to the parables that focus on concepts related to the Kingdom of God, others emphasize Christian living principles, such as mercy and who is one’s neighbor. Of course, we should also note that God expects us to develop these principles of Christian living in preparation for life in His Kingdom. Since the primary theme of the parables is the Kingdom of God, we need to keep in mind that the comparisons made are to illustrate principles related to this coming kingdom. As for which details of a parable contain spiritual meaning, we must let Christ make the interpretations or let other passages of Scripture guide our understanding. While all of Christ’s parables contain important truths, one of His teachings provides an overall concept that is fitting as a conclusion to this article. This parable is about the pearl of great price. Included among several parables focusing on the Kingdom of God, Jesus said, “Again, the kingdom of heaven is like a merchant seeking beautiful pearls, who, when he had found one pearl of great price, went and sold all that he had and bought it” (Matthew 13:45-46). Just as the merchant placed great value on acquiring an expensive pearl, we need to likewise seek and value becoming part of the coming Kingdom of God. Seeking God and His righteousness needs to be our life’s most important quest. To help you better understand the Kingdom of God and how you can be part of it, see the “Kingdom of God” and “Change” sections of this website. While not every parable in the New Testament is identified as such by Christ and the designation of duplicate references can be subjective, the following chart provides a list of 38 commonly recognized parables. This list harmonizes the accounts found within the three synoptic Gospels.